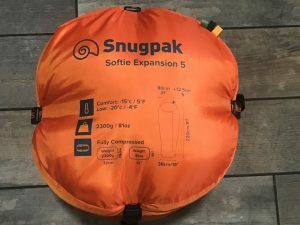 We purchased the Snugpak Softie Expansion 5 sleeping bag a few months ago and it has been used on a couple of occasions now. 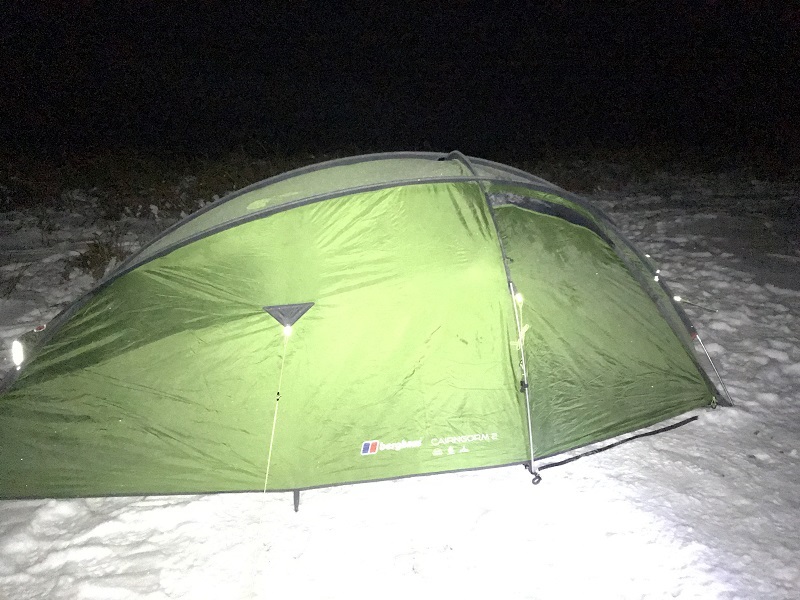 More recently we took it on a cold weather wild camp, where we knew the temperature could drop down to -2 or -3 degrees. On this early February camp, we got a little more than we expected as our plans didn’t go quite to plan. Without going into too much detail, we had made arrangements to go and camp somewhere near the Long Mynd, nr Church Stretton. Upon our arrival, we were informed that the road we needed to travel to get to the nearby carpark had been closed due to there still being snow and ice on the ground. This is the point at which we should have turned around and gone home, but instead we decided to see if we could get to our chosen destination via a different route – This was a mistake, and a mistake that resulted in us camping in snow and ice as we couldn’t travel any further and we were too stubborn to turn back. So we eventually managed to get the car safely away from the road and proceeded to pitch our tent, in the snow and ice and underneath what turned out to be a beautifully clear and very cold night – What better place could there be than to test a sleeping bag that was claimed to have a comfort level of -15 (minus 15). 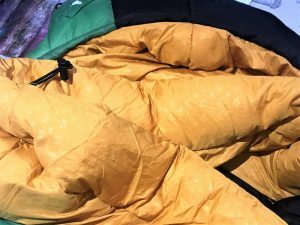 So, the sleeping bag how did it cope with the cold? Was I warm? It was dark by 6pm, so we got into our sleeping bags and I started typing in my phone. I was nice and warm as the temperature started dropping. We were high up, surrounded by snow and the temperature inside the tent dropped down to -5 during the night. My face was cold and the inside of the tent was glimmering with frozen condensation. The bag itself is very comfortable in respect of space, it is not restrictive and at one point I had my phone snuggled inside the bag as I was updating Facebook. At first I had the Softie Expansion open from the waist up, with just my legs in it whilst tapping away on my phone. I was on an insulated mat, wearing my hat, lined trousers, hiking socks, fleece and merino baselayer. 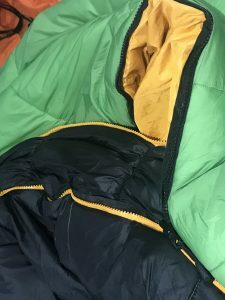 My legs were warm and the bag combined with the insulated mat meant that there was no cold causing problems from the snowy ground beneath the tent. The temperature on the readout was showing -2 and it was getting colder and I would soon have to get right inside the bag and get some sleep. 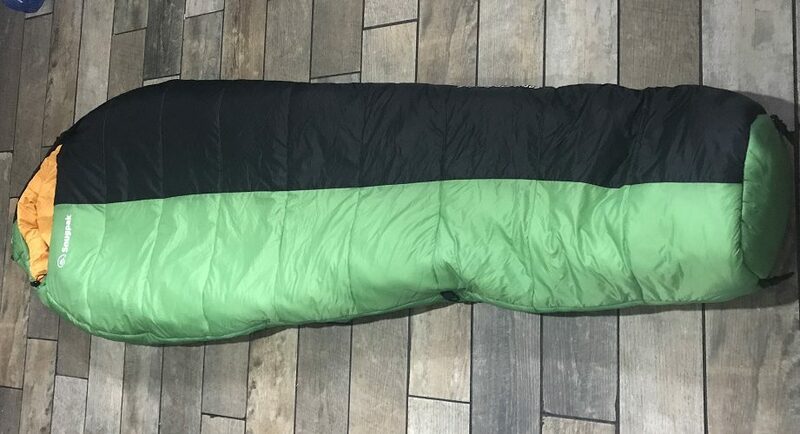 This particular sleeping bag is green and black with a warm orange interior. There are some handy clips on the outside of the footbox which are ideal for hanging the bag up to dry or store it uncompressed while it is not being used. The Softie Expansion 5 comes with a built brilliant little light on the hood. The LED light sits in a little pocket, I a perfect position for reading, but it can also be detached if you want to use it for other things – a great idea. Inside the bag is a thick, and warming shoulder/neck baffle that has it’s own draw string so you can adjust it to keep your body warmth in. There is a lot of insulation inside the hood to help keep your head warm and it’s rather comfortable too, with it’s own drawstring to pull it snug around your face. 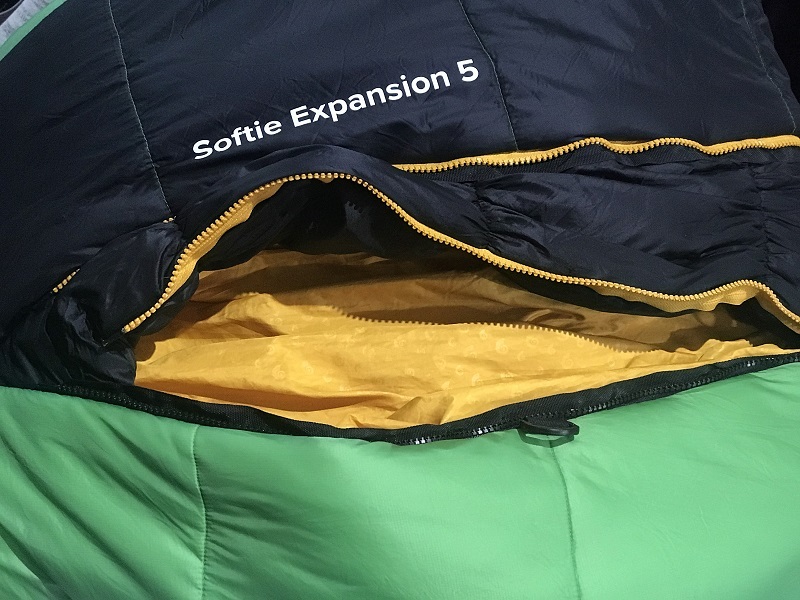 On the outside of the Expansion 5, the zip is covered over by a Velcro tab to stop it opening up and freezing you. Then you move on to the reason why this bag is called the expansion 5. 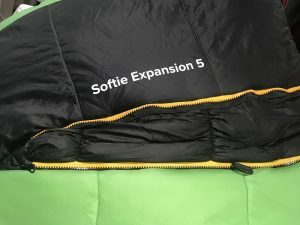 There is an extra panel built into the side of this sleeping bag, so if you want to make the bag wider to can do so. Just fully undo the main zip, reveal the expansion panel and rezip, done. You can also undo the zip from the bottom to get your feet out, either to give them an airing or get up and walk around. When in use, I had no problems with the zip snagging on the bag at all. I’ve experienced this on other bags but it didn’t happen on this one, always an advantage after that midnight dash to the loo. Changing from one size to the other is pretty straight forward, but you do have to fully unzip the bag to swap it over (obviously). When in the smaller size, the expansion panel actually acts as a large baffle that sits behind the zip. This zip baffle helps keep the warmth in and the cold out. 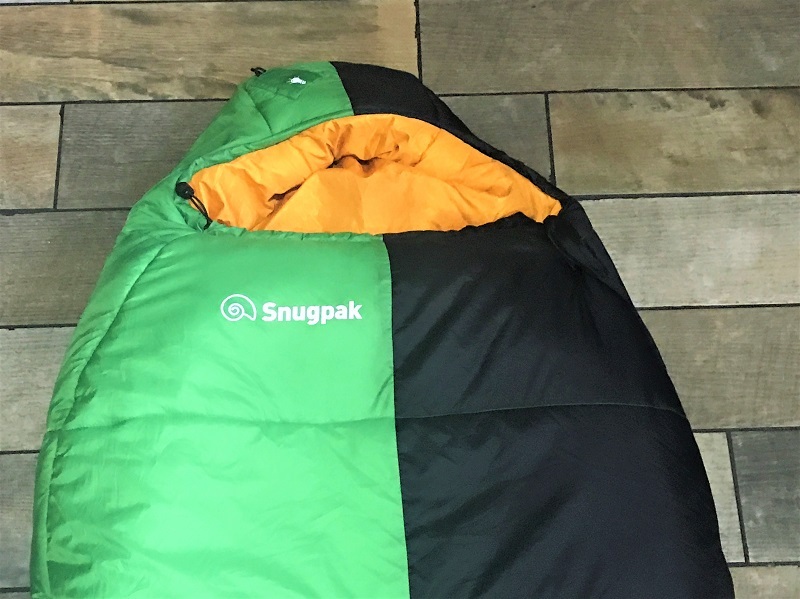 However, when you use the bag in the expanded form, there is no longer a baffle behind the zip (Snugpak you need to sort that out). The stuff sack is a good size, and I found it really easy to get the Softie Expansion back in. The pack size on this bag is not small. I will be honest here and say that I found it to be bigger than what Snugpak state on their website. 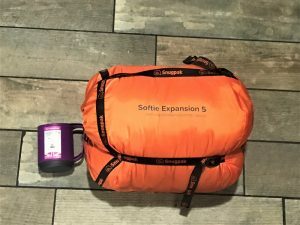 Personally I feel that a bag of this size is fine for car camping or maybe bike packing, but you certainly could not get it into a rucksack and fit anything else in there. However, I will say that it is lightweight, and you could always stuff it into a dry sack and hang it on the outside of your bag. Back to my night in the snow at -5, was I warm? 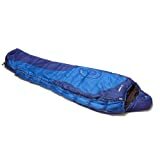 I was going to say that I was a little disappointed with this bag because it was supposed to be comfortable down to -15, and although I wasn’t cold and I slept well, I expected to be warmer. HOWEVER. Upon reviewing my notes and having tested it the way I did, I came to the realisation that this bag would have kept me warmer had I not been so lazy. Why is that then? I had put the bag in it’s expanded state, and couldn’t be bothered to unzip the bag and attach it to the other zip. This meant that there was lots of spare room inside the bag, too much for my body to heat up. 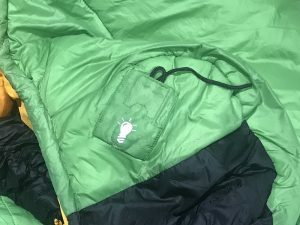 I found myself grabbing the inside of the bag and pulling it towards me, that made me warmer as the loft of the bag was closer and able to do it’s job. Also, if I had moved the bag onto the non-expanded size, the zip baffle (that I mentioned above) would have been in place behind the zip and not allowing the cold through to me. So on reflection, I do like this bag even though I haven’t (and probably never will) test it at -15. It did keep me comfortable at -5 and had I used it properly (instead of being lazy) I feel confident that I would have been much warmer. At the time of writing, this bag was available online for just £99, so if you can cope with the pack size then this is a winner that does deliver (sorry).